Two weeks ago, the alteration of Pitt football’s biggest tradition — singing “Sweet Caroline” at the end of the third quarter — left the program searching for a new tradition to take its place. Thanks to Head Coach Pat Narduzzi, they may have found it. Narduzzi and the Pitt football program announced Sunday night it would lock out the media from talking to the team’s players ahead of the second matchup in the four-game series against the Penn State Nittany Lions. This is the second year in a row Narduzzi has initiated this policy, and although he took criticism for it last season, he opted to do it again. But while it’s hard to argue with the results, it’s not the right path for the program to follow. First, it’s hypocritical with what Narduzzi says every other week of the year. Take last week, for example, when the coach said he was all focused on Youngstown State despite them being a relatively low-caliber team. When asked questions about the Nittany Lions, Narduzzi dismissed them, saying the Penguins were all that mattered and that every game of the season was equally important. With the blackout — which only happens during the biggest week of the season — he completely goes against that claim. By blacking out the media, Narduzzi is telling his players that the Pitt-Penn State game is bigger and more important than all the others. That’s the wrong message for the players, and it could potentially lead to lackluster efforts against other teams — like last week’s 28-21 overtime win over a non-BCS Youngstown State. To be honest, this game is the biggest one of the season by far, but it’s only fair to think that way as fans. 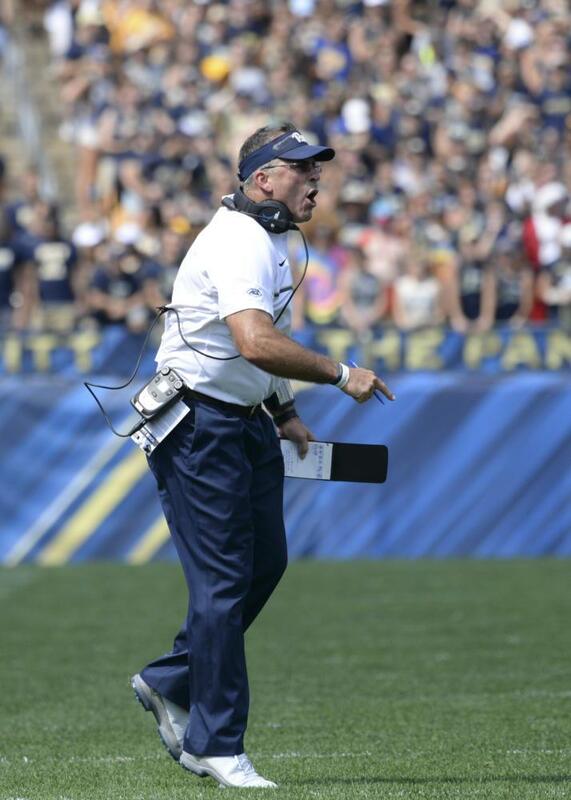 Narduzzi, his staff and Pitt’s players should not approach the game this way. This is particularly important considering their top goal coming into the season was to make it to the ACC Championship Game. This out-of-conference contest has no effect on that lofty task and will only damage the team’s overall record — even though a loss might allow for Penn State fans to gloat for a year. While the record could be in trouble, there are other shaky aspects of the program. Its place within the Pittsburgh sports landscape is another part which has suffered in recent years. For years, the team has struggled to find a place among the city’s three professional teams, both with fans and the media. Even on their flagship radio station, 93.7 The Fan, the Panthers rarely get brought up. Right now, the media would rather talk about preseason Steelers games and roster acquisitions than Pitt. It’s hard to blame them, since that’s what the city’s sports fans want to read and listen to. The Pitt football program — and the athletic department in general — need this to change. The media blackout won’t help. In its most important week of the year, when the city actually cares about the team, the media’s restriction of what it can say and do is going to have a negative impact. This week, for once, they would actually talk about the Panthers — and they may still, but with a reduced scope. The main point is this should be the exact opposite of what this week is for the program. Narduzzi and the players should be building this up as much as possible. Say something (mildly) controversial, tell us how much you hate the school and its culture or build some tension. Anything to generate a positive buzz and conversation about the program. Very few Pittsburghers cared when the Panthers knocked off the eventual national champion Clemson Tigers in November of last year. The spotty crowd of 35,425 the next week against Duke proved that. On the other hand, the team sold out Heinz Field for the Penn State game, drawing the largest crowd ever for a Pittsburgh sporting event. Pittsburghers care about the Pitt-Penn State game. Most don’t care about Pitt football. It’s time the program wakes up to that and starts to capitalize on its opportunities, even if they are few and far between.